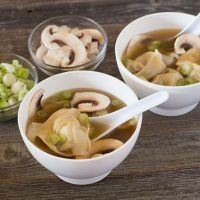 This Easy Wonton Soup Recipe is a rich chicken broth loaded with pork and cabbage filled wontons. 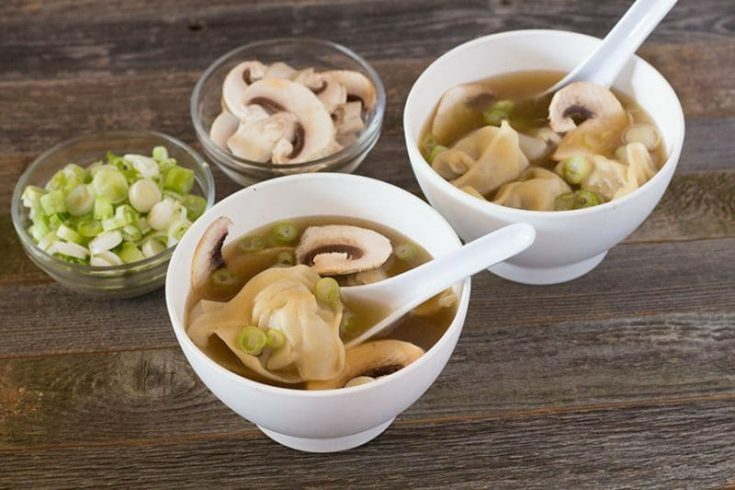 Top it with thinly sliced mushrooms and green onion slices for a restaurant quality soup at home! Wonton soup is one of the few soups I can make that won’t be meet with resistance or turned up noses when served. It’s not that my soup is bad, no one else in my life loves soup as much as me. When ordering out, wonton soup quality seems to vary between restaurants. Some places it is really good, and others it’s just meh. There are even nights that ordering wonton soup from the really good places results in disappointment. If you have followed the blog, you already know my solution to these kinds of problems. That’s right, I’ll make it myself. I figured it couldn’t be any worse than some of the disappointments we have had. And if by some off chance it was, we could always order pizza or eat a sandwich. This recipe was inspired by the numerous Asian restaurants I have eaten in or carried out from. This is not anything authentic, but it is simply the way we like it. If you prefer something different in your soup, or in your wontons, feel free to make your own adaptations. I actually encourage you to “play with your food” and make it taste just the way you like it. At my house, we prefer to serve this with thinly sliced mushrooms and green onions on top. In all reality, one of us likes it on top, the other prefers his mushrooms slightly cooked, so that means his goes on the bottom of the bowl and allowed to sit in the hot broth before I add the wontons and more broth. If I liked mine slightly cooked, I would just add them all to the pot of soup, but I don’t. Sliced water chestnuts, bean sprouts, or thinly sliced Chinese cabbage can all be added to the soup during the final minutes of cooking or added when servings. I like them all in my soup. When I first started making wonton soup I thought that the broths deep color came from soy sauce. It may in some places, but it made my Won Ton Soup too salty. Perhaps they are using some rich homemade bone broth. Since this is a quick weeknight dinner for me, I don’t have hours for all that. Instead, I add just a touch of beef broth or beef stock. It darkens up the broth just a touch and adds an extra depth of flavor. If you prefer not to use it, the soup will still be delicious. Once the wontons are formed, they can be frozen in a single layer on a baking sheet. Once they are frozen solid they can be removed and placed in a freezer container. I have never kept these more than 2 months, so to comment on a longer storage time would be unfair. I am calling the storage time 2 months on these. Wontons, once cooked in the broth, do not store or reheat very well. The wontons will deteriorate and look more like tiny meatballs with some broken up noodles. It tastes OK, it is just not very attractive. So, I suggest only cooking as many wontons as you intend to eat that meal. 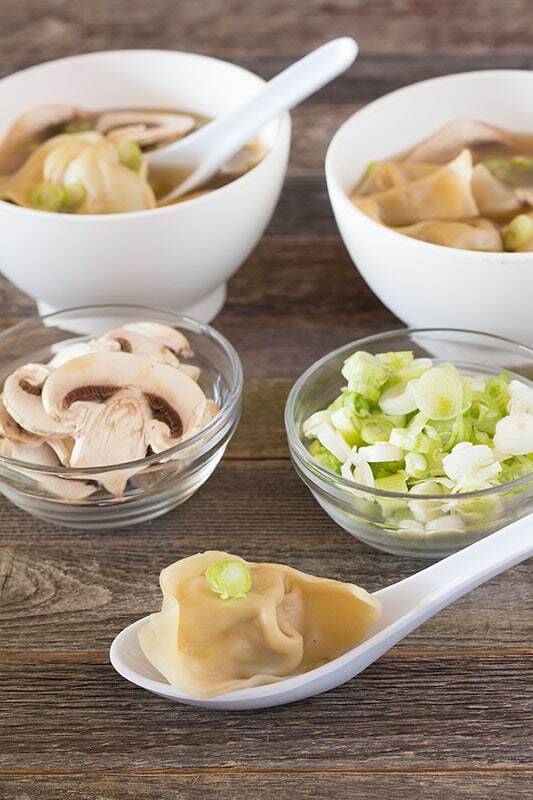 Freeze the rest and add the frozen wontons to your Wonton Soup the next time you are ready to eat it. Give them an extra 3 minutes or so to cook from a frozen state. I have only used the wonton wrappers available at most grocery stores. Easy to make Won Ton Soup with Pork Filled Wontons. Add both chicken broths and beef stock to a large pan and set heat to medium-low. Once broth begins to simmer, set heat to allow soup to continue cooking at a slow simmer. Place pork in a mixing bowl. Add sesame oil, soy sauce, and white pepper. Mix well. In a food processor, blender, or by hand, finely mince the water chestnuts and add to the pork mixture. Repeat with 8 large white mushrooms. Save remainder of mushrooms to thinly slice and use as a garnish when the soup is finished. Slice 3 greens onions, both white and all of the green parts, very thin and mince as you would garlic, or use a food processor. Add to the pork mixture. Mix well. Fill wonton wrappers with 1/2 teaspoon fillings. Wet edges and seal in the desired shape. Thinly slice remaining mushrooms and set aside. Thinly slice remaining green onions and set aside. Once all wontons are formed, place in refrigerator until ready to cook. Once ready to prepare soup, taste broth. If it has become too salty from simmering, add water a cup at a time until the desired salt level is achieved. Gently add wontons to the soup. Allow broth to come back to a boil, then immediately reduce heat to medium-low. Continue simmering until wontons begin to float. Once wontons float, allow them to simmer another minute or two. Taste a wonton to make sure that the wrapper is cooked through and no longer doughy. Continue simmering until wontons are done. Ladle soup into bowls and top with thinly sliced mushrooms and green onions. Nutritional calculators may vary. Please check your favorite one if dietary information is vital. Let us know what you think after you try it! Believe it or not, we eat a lot of this during the summer. Yum. I’m a souper hero too. Can’t wait to try this recipe, thanks!